I think we could all use a little motivation to get healthier, and what better motivation than a fun challenge! Slimkicker is a healthy living and fitness app that provides forums, calorie counting tools, challenges, and giveaways to entice users to make healthy changes. You earn points by counting calories or completing challenges that can be used towards rewards. They want to hear from you what diet or fitness challenge you’d like to participate in, like not drinking soda or eating processed meats for a week. 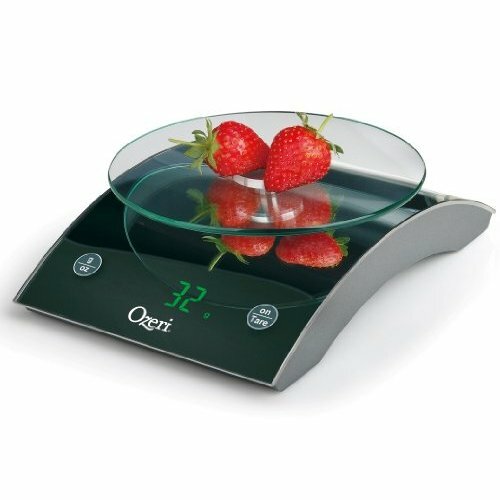 Leave a comment with your idea for a challenge, then SlimKicker will pick their favorite, and the winning commenter will get this Ozeri Epicurean Kitchen Scale! Comments will be accepted until 8 pm Eastern, September 2nd. I look forward to hearing what everyone comes up with! Posted in Giveaway and tagged giveaway, health challenge, slimkicker. Bookmark the permalink. Replace all of your coffee with green tea for a month. No food after 8:00pm for two weeks. Most nights I find myself making dinner after 7:30pm, which means my husband and I don’t eat until 8:00 or later. This doesn’t give our bodies much time to break it down… not good! Give up my daily handful of M&Ms after lunch until I lose 5 pounds. Try a different workout or class twice a week for a month. I’m training for the marathon and found that I got in kind of a running rut and was even getting injured. By mixing up my workouts – adding in some spinning or yoga or pilates – I’ve actually helped improve my endurance. Plus mixing it up keeps your workouts from getting boring! No processed food for 1 month. We’ll see if the belly fat disappears. good ideas so far. How about an all-raw food challenge for a week? to spice things up. Try drinking coffee and lattes with out sugar and always use skim milk. No carbs at dinner for a month. Eat Subway 2 times a day for a month! Use smaller plates. Wedding pictures here I come! No dessert for a month….. hope to lose a few pounds this way. Pingback: August Restaurant Round-Up & Giveaway Winner!